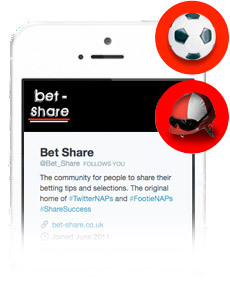 BetShare | Our services | what you'll find on the site - Free tips galore! BetShare is all about the wisdom of our followers. Have you got a hot tip, or a bit of insider information? Or perhaps you’ve conducted some analysis and come up with a system that can’t fail? Maybe it’s just your own thoughts on which horse/team/person to back. Whichever, this is the place to share them with everyone else. It’s what we’re all about! #Sharesuccess. 1How many followers do you have? We have many followers who just love sharing their tips with other punters. Some of our followers are simply on the lookout for great tips, and are happy to #ShareSuccess when they win. Others just love our banter! But we'll be honest, mostly the first two. 3How often do you tweet? We just LOVE helping you #beatthebookie and so we have a team of keen tweeters tweeting round the clock. Tweet us, and you can expect a reply within an hour or so. Tweet us something we don't like and it may be longer. 4How do I get involved? 5What's this TwitterNAPs & FootieNAPs of which you speak? We came up with TwitterNAPs to separate the tipping wheat from the tipping chaff. Simply put, tipsters sign up for the TwitterNAPs and they are ranked on how successful their tips are. Tip successfully and they get points, tip stinkers and they get points taken from them. Monthly winners get hoisted shoulder high by their peers and carried round the parish. (Figuratively speaking). Look out for the tips of the tipsters that consistenly finish well on the Tipster Table - they know what they're talking about. Looking for the best racing tips all in one place in an easy to understand and consistent format? You've come to the right place. TwitterNAPs is the place where tipster share their top three bets, every day, in the unique Bet Share format. You can use our bang up to date table to see which tipsters are on hot streaks and which are best avoided! Our unique format means we are the home of the famous BetShare treble. Each month about 5-10 of the trebles tipped on these pages will come crashing in, with a whole load of tipster noise. Most are over 100/1 and the biggest shared ever was 1,800/1. Get on one today! Divided into a NAP (safe bet of the day) NB (Next Best bet of the day) and IWAC (In With a Chance - an outsider with odds of 5/1 or greater). Use them individually, as a treble, or a mixture from different tipsters. Good luck, and remember to share your bets with us!